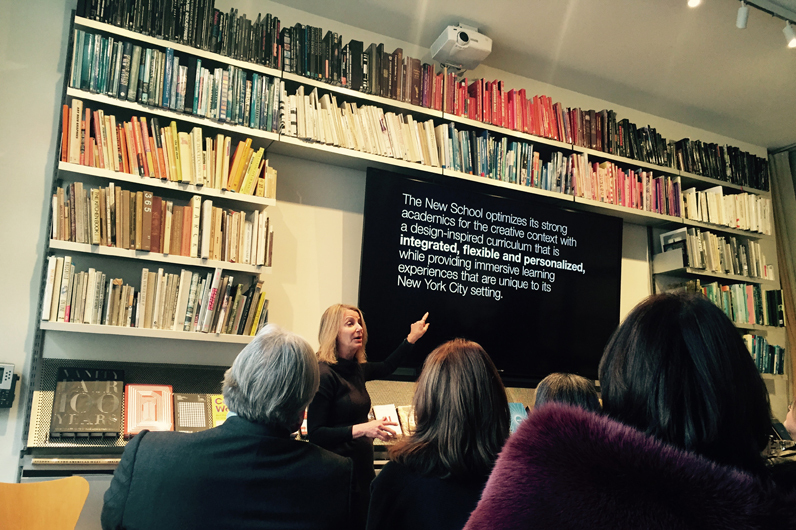 Paula Scher, one of the world's leading graphic designers and a partner at Pentagram, discusses The New School's new visual identity with university leaders. But when it came to her partnership with The New School, “the opposite was true.” Employing its own iterative, design-inspired process, the university harnessed the collective creativity and problem-solving skills of hundreds of people in various disciplines across the university to achieve a unifying visual identity. The result is a revolution in typography. Dynamic, forward-looking, and instantly recognizable, The New School’s new visual identity embodies the progressive mission of the university and represents a technological leap in the art of type design. “Utilizing innovative custom typography by Paula Scher, one of the great graphic designers of our time, the identity establishes a distinctive brand for The New School as a whole while also highlighting the university’s individual schools, institutes, and programs,” says Joel Towers, executive dean of Parsons School of Design at The New School. The key to the new visual identity is a groundbreaking custom typeface called Neue (pronounced NOY-a). Inspired by the Ruedi Baur-designed typography of the New School’s University Center, it is revolutionary in its deployment of three different symbol widths — regular, extended, and very extended — that are programmed together using an advanced algorithm. This “flexibility in syncopation,” as Scher describes it, allows The New School and its individual school names to retain their own unique character while remaining connected to one another. What’s more, the new identity incorporates a pair of parallel lines that anchor The New School wordmark and provide an organizing device to display the names of the various schools and programs at different scales in relationship to the logo. The system enables the New School to stand alone at large scale, or act as an endorser when connected to schools such as Parsons and Eugene Lang College. It also allows the university to continue to grow and change, and supports the different names to work alongside The New School brand. “It’s bold, innovative, and adaptable to the ongoing evolution of the university and its parts,” Towers says. Scher notes that the new identity expresses two important ideas: the relationship between The New School as a university and its various schools and the nature of its design-inspired curriculum, which is integrated, flexible, and personalized. Not coincidentally, the new visual identity was created using this design-inspired approach. After gathering input from hundreds of individuals from throughout the New School community — university leaders, faculty members, students, members of the board of trustees — Scher and university leaders convened on numerous occasions to hammer out a design concept and ultimately produce the new visual identity, now emblazoned on The New School’s website and university signage. The student body had a hand in the process, too. Over the past semester, students in Collab: University Design Studio worked with the new visual identity system to create designs for display on the water towers in The New School’s building on 68 Fifth Avenue and in the lobby of the University Center. Lucille Tenazas, Collab instructor and associate dean of the School of Art, Media and Technology at Parsons, says the new visual identity creates myriad learning opportunities for students. “I see this as opening up even more possibilities, whether to revert to a purposefully ‘conventional’ use by circumventing its expressive mandate, or to go to exponential levels of design applications that have never been anticipated by Pentagram,” she adds.